Bentley’s SACS now includes an integrated analysis and design solution for the complete lifecycle of offshore structures, including construction, transportation, in-place, and decommissioning. This new capability enables engineers to reduce heavy offshore structures into manageable pieces when removing them from complex working environments. This latest advancement in SACS reinforces Bentley’s commitment to adapt its offerings to meet the changing requirements of the offshore energy industry. According to a recent report by IHS Markit, there has been a significant rise in the number of planned decommissioning projects, which is attributed to global economic conditions and assets in mature fields reaching their end of life. As decommissioning carries similar risks and challenges to marine construction, special consideration must be applied to the safety, environmental, economic, and social aspects of any project. The SACS decommissioning capabilities automate the process and allow engineers to determine optimal cutting plans to meet decommissioning project requirements, such as structure weight for lift and transport. Users fully control the structural weight through change in elevation and can apply automatic cutting of the structure at user-defined elevations. Sum of forces for any elevation can be reviewed graphically or in tabular reports. With integrated workflows spanning AutoPIPE and SACS, piping design for offshore structures can be completed in hours instead of weeks. 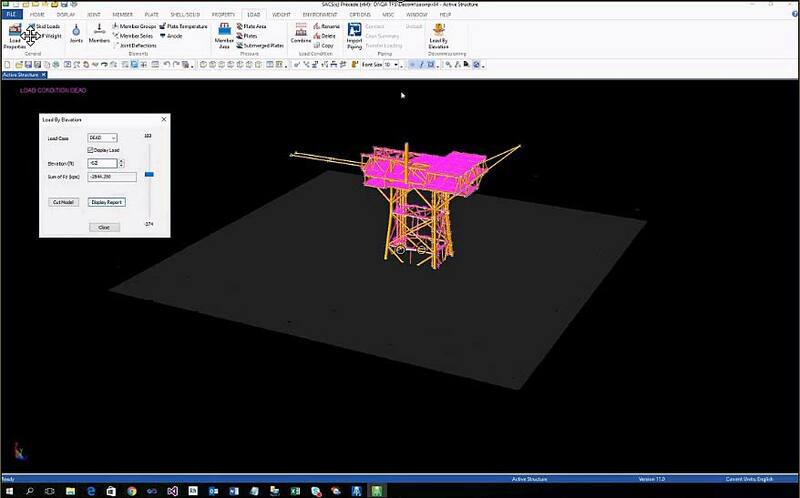 Workflows to add pipe loads to offshore structures improve efficiency and provide accurate analysis results. Importing piping geometry from AutoPIPE into SACS enables the design of secondary steel and piping connection supports on the primary offshore structure. Users can perform combined stress, and pipe and stress analysis after they have imported piping connections and the structure from SACS into AutoPIPE. Moreover, importing support reaction results from AutoPIPE to SACS for structural analysis can save hundreds of hours of manual data entry. Lastly, completing the design and analysis with realistic models results in potential costs savings and improved risk mitigation. Engineers designing FPSO topsides have indicated they can spend 40% of their time developing detailed finite element models of the complex joints in these structures. SACS Precede drawing options enable easy creation of plate surfaces from any orientation, improving efficiency for meshed joint generation. Additionally, the SACS methodology eliminates the requirement to model joints externally to determine SCFs, or perform fatigue analysis or detailed strength analysis. A SACS finite element mesh, a model that captures complex connection behaviours, is fully integrated with SACS beam elements to enable simple and powerful workflows. Engineers can easily create meshes within seconds, for any complex joint, all within a single interface, and save hundreds of man-hours in manual calculations. The simplified process enables completion without requiring specialist finite element expertise.